On Monday (6/30), the EIA reported a gigantic drop in U.S. oil demand. And the figures are for April -- way back in the good ol' days when crude prices ranged between $110-$120. WASHINGTON, June 30 (Reuters) - U.S. oil demand in April was 863,000 barrels per day less than previously estimated and down 811,000 bpd from a year earlier, putting petroleum consumption at the lowest level for any April month in six years, the Energy Information Administration said on Monday. The lower oil demand was due to rising fuel prices and a faltering U.S. economy that has cut into petroleum use. U.S. oil demand in April was revised down 4.2 percent from the EIA's early estimate of 20.631 million bpd to the agency's final demand number of 19.768 million bpd, and was 3.9 percent less from 20.579 million bpd a year earlier. So it strains credulity in the extreme to say Chinese demand is behind the run-up in prices since March. 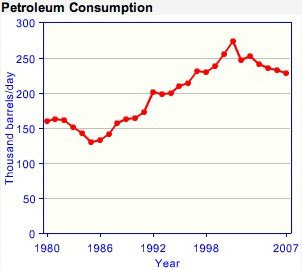 The drop in U.S. consumption in one year (April 2007 to April 2008) was more than twice the rise in Chinese consumption from 2006 to 2007 (325kbd, according to the BP Statistical Review 2008). In other words, the April drop in U.S. consumption wiped out one year's worth of growth from China (325kbpd), Saudi Arabia (149kbpd) and India (168kbpd) combined, and then some. Put it all together, and the "demand outstripping supply" theory of the feverish price action since March is emanating an extremely fish-like odor. U.S. demand down by a whopping 0.8mbd year-on-year. That's the elephant in the room now. Update and more detailed info on this topic here. The peak oil community is obsessively focused on images like this. Peak graphs are presented for every country, like a slide show, and after viewing the whole series, you're damn lucky if your eyeballs haven't turned white and coagulated from raw anxiety. But that's just one side of the story. Today I'd like to show you a different series of peak oil graphs -- the ugly stepsisters who don't seem to get any attention. 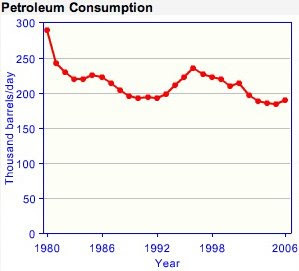 These are the graphs of peak oil consumption. Figures and images come from EIA country profiles. 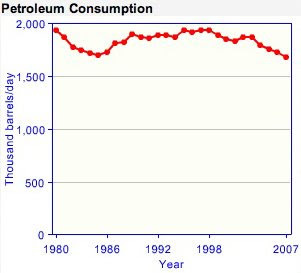 Take a deep breath, and fasten your seatbelt for a rude awakening to the realities of "peak oil". 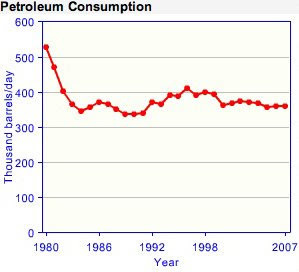 As you can see, "peak oil" occurred in 1996 in Japan -- 12 years ago -- and was an entirely demand-driven phenomenon. Wooh baby, that'll turn your hair white... Israel "went over the cliff" in 2001, and is now down 16% from it's peak level. Savinar says a 10-15% drop will put your economy in the hospital -- shatter the economy and reduce the population to poverty. Apparently Italy didn't get the memo. 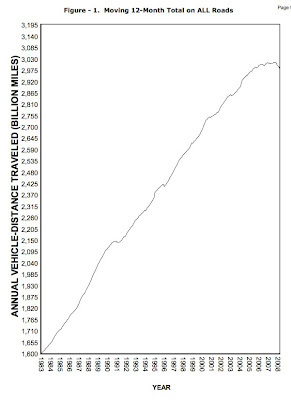 It's such a shame because these graphs hold the important clues about peak oil. Yet they get almost none of the airplay. 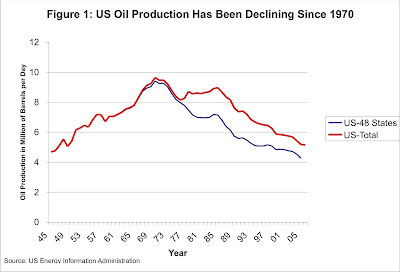 The fact that oil production will peak is just a truism -- a statement of basic logic. 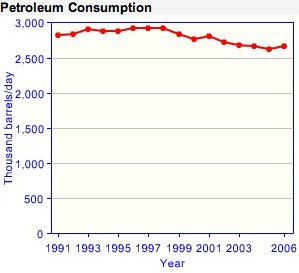 The fact that a country can reduce it's oil consumption without duress is like a miracle... something to really think about and learn from. As you can see we're having a "Hubbert Peak" in demand. Gasoline demand in the United States may have reached its peak, as rising prices lead consumers to make long-term decisions that will weaken demand in the years to come, according to a new analysis by Cambridge Energy Research Associates (CERA), an IHS Inc. (NYSE: IHS) company. The report, Drivers Turn the Corner in the United States, conducted by CERA’s global oil service predicts that U.S. gasoline demand will likely decline in 2008 for the first time in 17 years. 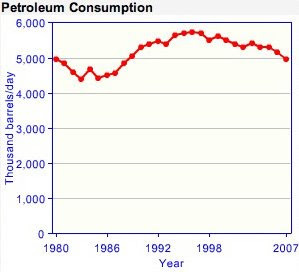 If petroleum prices stay at or near their current levels, 2007 could prove to have been the peak year for U.S. gasoline demand. Japan's Ministry of Economy, Trade and Industry reported on Thursday that gasoline demand declined for a second year in 2007 on rising oil prices, urging refiners to export record amounts of fuel. And the trend is continuing. The most recent May 13 Oil Market Report from the IEA reports (P. 6) gasoline demand for March 2008 down (year-on-year) by -8% in Germany, -4% in the UK, -14% in France, -10% in Italy, -9% in Spain and -14% in Japan. Similarly, diesel was down -4% in Germany, -6% in France, -4% in Italy, -10% in Spain and -10% in Japan. And those are the figures for March, before oil prices really went vertical. Anyway, lots of good news. The fear factor of peak oil drops considerably if demand peaks before oil does. June 2 (Bloomberg) -- Iran, OPEC's second-largest oil producer, increased the number of tankers idling in the Persian Gulf to at least 14, indicating it may be storing more crude, ship-tracking data show. It turns out that we've got a heavy oil glut. The physical oil is being discounted, to make it move. Saudi oil minister Ali al-Naimi said last month Saudi Arabia had boosted oil output by 300,000 barrels per day and would achieve 9.45 million bpd in June to meet rising demand and to compensate for lower output from other producers. The kingdom's state oil company Saudi Aramco is due to inform refiners how much crude they can lift in July later on Wednesday or on Thursday, refinery sources say. But refiners expressed little interest in additional crude supplies, especially if these were of the heavy type. Refiners faced with rising prices for premium grades of crude oil are rushing to expand their ability to process less expensive, dirtier crudes, but their efforts face concerns about pollution and global warming. Yup, NIMBYs and global warming activists are jacking up the price of oil. "Not enough oil" is just the cover story. LOL. As expected from Day One of this blog, peak oil continues to drive a strong resurgence of nuclear power. Japan's Toshiba Corporation expects orders for at least 33 nuclear power reactors by 2015, and plans to expand all its nuclear businesses over the period to 2020, according to the company's president. Mitsubishi Heavy Industries (MHI) has announced a major project to increase capacity at its Kobe shipyard, where it will double capacity for large nuclear power plant components. Akira Sawa, head of the company's nuclear power division, announced his major goals at a briefing attended by reporters for the Japan Atomic Industry Forum's Atoms in Japan publication. According to Atoms In Japan, the company will double capacity for forging reactor pressure vessels and internal reactor components with the aim of boosting its share of the global reactor business. It should be able to produce all the major components (reactor vessel, main coolant pumps, steam generators, steam turbines and generators) for two nuclear power units per year. It will be hiring 1000 more employees for its nuclear division, taking the total to around 5000 by 2013. Already, MHI's Futami plant in Kobe can produce vessels for two-, three- and four-loop pressurized water reactors (PWRs), including a 590 tonne model for the 1538 MWe APWR. After the upgrade the plant would be expected to handle even larger components. At present, the largest reactor in the world is Areva's EPR at 1650 MWe, and in future the largest could be expected to reach 1800 MWe and require a correspondingly larger pressure vessel. Sawa said his company expects to gain 25-30% of an export market of 130 reactors by 2030. His figure represents a target market that does not include the 12 units forthcoming in Japan, or the 20 and 110 light water reactors to be built in Russia and China respectively by that date. Russian and Chinese planners are preparing domestic facilities for their own needs as well as for export. As noted in #357, Michael Masters sparked a whirlwind of debate by pointing out the role of long-only index speculators in pumping commodity prices. In addition to the issue of index funds accumulating long positions and thereby imputing an upward bias to commodities, there is another opportunity for market manipulation with respect to the construction and rebalancing of prominent commodity benchmarks such as the Goldman Sachs Commodity Index (GSCI). As reported by the New York Times on September 30, 2006 Goldman Sachs significantly readjusted in August of that year the GSCI's gasoline weighting. Index products tracking the GSCI, and representing an estimated $60 billion in institutional investor funds, were forced to rebalance their portfolios resulting in an unwinding of positions. Originally, unleaded gasoline made up 8.75 percent of the GSCI as of 6/30/2006 , but this was changed to just 2.3 percent, representing a sell-off of more than $6 billion in futures contracts. 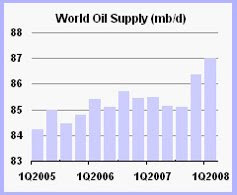 As a result, gasoline fell 82 cent in the wholesale market over a four-week period, an unprecedented move; and crude oil, which in July 2006 traded over $79 per barrel for August delivery—at the time an all-time record—subsequently fell to around $56 by January 2007. While the notion of a president single-handedly having the power to muscle a global market is highly questionable, the downturn in prices was welcome news for the then ruling party. Subsequently, Goldman Sachs sold its index business to Standard & Poor's including the GSCI commodity index family. Unsurprisingly, the visibility of the GSCI brought Goldman Sachs unwelcome attention, especially given the coincidence of its former chairman's appointment as Secretary of Treasury, and an unscheduled GSCI rebalancing that forced a dramatic sell-off in the gasoline and crude oil futures market. I find this extremely interesting. Institutional investors were forced to liquidate their unleaded gasoline futures due to a change in the composition of the GSCI, and gasoline dropped 82 cents in a month. The New York Times article Frankfurter refers to is online here: Change in Goldman Index Played Role in Gasoline Price Drop. Goldman Sachs, which runs the largest commodity index, the G.S.C.I., said in early August that it was reducing the index’s weighting in gasoline futures significantly. The announcement did not make big headlines, but it has reverberated through the markets in the weeks since and some other investors who had been betting that gasoline would rise followed suit on their weightings. “They started unwinding their positions, and those other longs also rushed to the door at the same time,” said Lawrence J. Goldstein, president of the Petroleum Industry Research Foundation. This information strengthens my view that institutions/individuals investing in commodities through index products should be strictly regulated. This guy is starting to understand "peak oil". 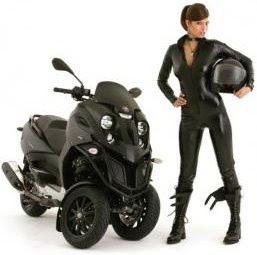 Get a scooter and quit worrying about it. 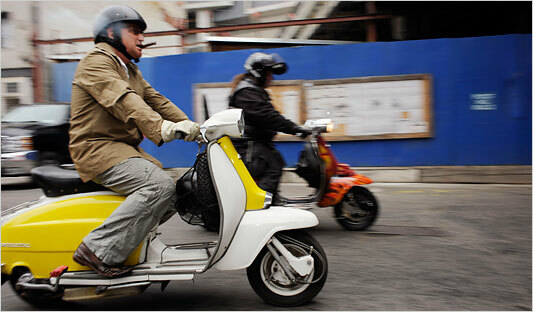 Scooters are winning converts, and not just for the romance of Vespas. Last August, Chris Casal, a 32-year-old elementary school teacher who lives in Brooklyn Heights, bought a scooter for his commute to Williamsburg, in part because of concerns about gasoline prices and parking. Since then, he estimates he has driven his car only 15 times and usually only when it was cold or less than 20 degrees outside. Even though he lives only five miles from work, it is a 45-minute trip by subway or a 12-minute drive. This machine has an unbelievable fuel efficiency of 170mpg (=71km/liter), and will be available later this year (Source). This particular model is quite expensive, but that's not important. Cheaper competitors will flood the market when demand justifies it. The important point is how incredibly fuel efficient personal transportation can become in response to higher oil prices -- with off-the-shelf technology that is ready to roll, today. This is a great trend, and a model for the future. People losing interest in cars... Why do we need oil again? Favorite quote from the article: "Having a car is so 20th century." 7.8 million to 5.4 million units in 2007. Japanese consumers are, the less interested they are in having a car.